The beloved Dr. Panda has been everything and everywhere from Earth to space. Now he’s back at it again at his very own school. Yep, Dr. Panda School is the latest in the popular Dr. Panda line of apps. Dr. Panda School is a school-themed digital playset with five interactive locations: the hallway, classroom, art room, cafeteria, and school yard. Each location is filled with familiar Dr. Panda characters and various interactive surprises, which kids use to role-play and create their very own stories. The gameplay is very much self-directed, and there is no right or wrong way to interact with the app. Instead, kids are encouraged to explore and experiment with everything they find. At each location, kids can add or swap out characters by tapping on the bear icon on the right. They can also give the characters items to hold or interact with, or dress them up with clothes and various accessories. There are 19 characters in all, ranging from child to adult, so you can role-play as a student, teacher, and even parent. While the same character can’t be at multiple places, it’s easy to move them around using the character tray. An interesting detail is that items worn or held by a character is always kept until removed, thus it is possible move items to different locations this way. For example, you can move a flower from the garden to the classroom, or food from the cafeteria to the classroom. The first location you can explore is the classroom. There is a computer and working printer on the far left, and a dollhouse and a pet hamster that kids can feed and play with. The desks, along with books and tablets, are on the right side. There is a blackboard that functions as a simple calculator; kids can drag numbers onto it to make addition and subtraction problems. They can also draw on it with colorful chalk. Next is the art room where kids can try their hands at all sorts of activities from painting to pottery to woodworking. There is even a clever reference to Hoopa City where multiple shapes can be combined to make toy airplanes, trains, and more. On the far left, there is a sink, some aprons, and a first-aid kit in case somebody gets a boo-boo. The hallway has lockers, trophies, books, and a TV screen. Plus it has a toilet so kids can help their characters go potty. They can also peek into the janitor’s closet and use the tools they find there to clean up the place. The school yard has a playground on one end and a garden on the other. The playground has various equipments, such as the seesaw and slide. Kids can dig holes in the garden to plant seeds, and also pick fruits and berries to eat. Tip: flowers can be made into crowns by dragging them onto a character’s head. In the Nurse's Office, kids can discover more outfits, doctor tools, and equipment. They can measure each character's height and weight, check their temperature, and treat sick patients with sick medicine. There's also an X-ray machine to see what each animal's bones look like. Similar to other Dr. Panda apps, Dr. Panda School has no set goals or objectives. Instead, kids are free to discover what the app has to offer. This flexible gameplay makes the app appealing for ages 3 and up. Also, there is no text in the app which means kids don’t have to be able to read to play. If you’re worried about your child’s safety, rest assured because Dr. Panda school contains no third-party ads and no in-app purchases. Furthermore, Internet connection is not required to use the app. 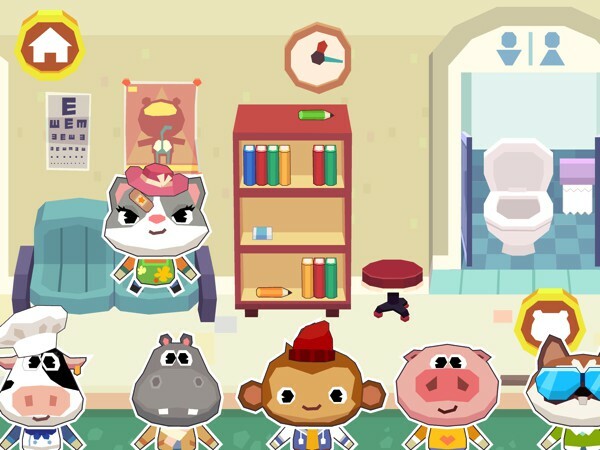 Dr. Panda School is perhaps the most expansive app from Dr. Panda since Hoopa City. With tons of secrets to discover, this app is guaranteed to have a long shelf life. It also offers plenty of room for imagination and creativity as kids develop their own stories for the characters in the app. What makes the app great is it features an environment that most kids are familiar with. Those who are already in school will know the routines, and be able to immerse themselves in the game. On the other hand, kids who are still in preschool can use the app to get an idea of the activities they will encounter. In Dr. Panda School, Dr. Panda goes back to their 2D roots by going with minimalistic graphics and animation. I personally love 3D graphics, but I think it would overcomplicate the app. On the contrary, this paper-inspired style looks clean and simple. Plus, it allows the child to feel in charge of the gameplay. Dr. Panda School lets kids be in charge of their creativity and imagination as they tour a virtual school filled with tons of interactive surprises. The open-ended gameplay encourages discovery and experimentation while keeping things stress-free. There is also plenty of room for storytelling as kids try out various roles from student to teacher to janitor. All in all, it’s a highly recommended app. The vibrant Dr. Panda Candy Factory lets kids explore the exciting and delicious world of confectionary. Using simple controls, they control the machines in Dr. Panda’s factory and experiment with colors, flavors, and shapes to create tasty sweets. There are no rules, so kids can channel their creativity and have fun.